Any colorful mix of fresh fruit can take on a tropical look when you present it simple and bit size. There is no doubt that the hosts of this podcast always look forward to getting behind the microphone and pouring the first cocktail. When a fan of the show sends us a drink recipe we are happy to test it out. Listener Stacie sent in a recipe for a ginger mai tai that all of us have been drinking for days. Kalani decided to call it Stacie's My Tai. You will have to invest a little time to make Sunshine's Very Spicy Rum, but you won't be sorry. By request we discuss some of our favorite tiki resources for cocktails, mixology and polynesian kitsch. Our favorite tiki mixologist superstar is Beachbum Berry. Beachbum Berrry books, Total Tiki app are some of the best resources out there. Get the print books to use at your bar and have the app loaded on your phone or iPad for tiki info and cocktail recipes on the go. A superb rum resours is 5 Minutes of Rum podcast. The host of this show tirelessly sips rum from all over the world and gives you and idea of what to expect when you grab your own bottle. Each show also includes a cocktail recipe, usually a nice classic that shows off the rum being discussed. For expert advice on where to find the best exotica and mid century tunes, turn to Digitiki.com. Exotica can be hard to locate. Many artists are not available in digital form and tracking down vinyl can be time consume. Digitiki will give you sites to visit and info on the latest releases. Plus interviews with artists and an occasional guest host. The event we are most excited about right now is Mod Palm Springs sponsored by Zen Tiki Lounge and many others. Coming this October 10-13 in sunny Palm Springs, CA. The Zen Tiki Lounge will be live on the hotel grounds all weekend hosting the famous room crawls and parties. Use the link to book your room and pendant package now. This event will sell out. Listen to the show for details on the bands, artists and more. Poly Hai is every tikiphiles educational institution of choice. Join the page on Facebook so you don't miss out on any of the offerings and events happening all across the USA. Catch all your friends from Poly Hai at Tiki Oasis this August. Its fun to drink at school. Even more fun to school your drink. 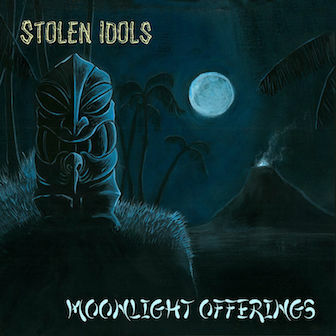 Music on this weeks show includes Arthur Lyman, Stolen Idols and the Tiki Delights. Pop those earbuds in and enjoy the show. Be sure to subscribe to the podcast to support us and you won't miss all the fun.